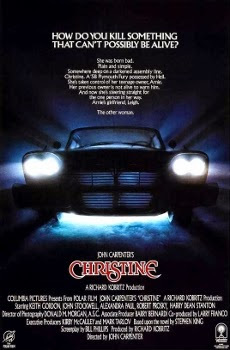 Christine was released into theaters on December 9th, 1983. Filming locations include Anaheim, Calabasas, Canoga Park, Irwindale, Monrovia, Newhall, Pacoima, Santa Clarita, S. Pasadena and Tujunga, Ca. This was John Carpenter's fourth directed film of the 80's. It also happens to be my favorite Carpenter film, yes...I even like it more than Halloween. Based on Stephen King's novel of the same name. King's popularity was so high at the time, the film went into production before the book was even published. Unfortunately, much of the backstory and sub-plot couldn't be carried over from the book because it would've just been too long for a major motion picture. The lead of Arnie Cunningham was played by Keith Gordon, who had been in Jaws 2, five years prior. William Ostrander played Buddy Repperton, the leader of the bullies who constantly antagonize Arnie. For some reason, the scene where they bully Arnie in the school shop absolutely terrified me when I was a child. At the HorrorHound Cincinnati convention in March of 2013, I had the pleasure of meeting William Ostrander, Malcolm Danare (Moochie) and Steven Tash (Rich) in person and they were kind enough not to steal my lunch and step on my glasses. All kidding aside, they were all super nice guys. The film not only has a terrific score, written and composed by John Carpenter and Alan Howarth, but it has a solid soundtrack. Some of the songs featured include Bad to the Bone by George Thorogood & The Destroyers, Keep A-Knockin' by Little Richard, Little Bitty Pretty One by Thurston Harris, Beast of Burden by The Rolling Stones and Come On, Let's Go by Ritchie Valens. The films first DVD release was on August 3rd, 1999. Aside from Christine, there were a couple other really nice cars featured in the film, Dennis Guilder's 1968 Dodge Charger 440 and Buddy Repperton's 1967 Chevrolet Camaro Super Sport. A few years ago I actually had the same license plate number (850 TLX) that was on Buddy's car in the film, as the license plate for my own Camaro. Over the years, there have been Christine model kits and a number of 1:64 and 1:18 scale die-cast collectible cars released by toy companies. In 2015, Hot Wheels released 1:64 scale cars of Christine as well as Buddy's Camaro. Toy companies like Auto World, Greenlight, Johnny Lightning and RC2 also released collectible cars from the film that included variations of Christine as well as the cars of Buddy and Dennis. For the film, Christine is identified as a 1958 Plymouth Fury. It took transportation coordinator Eddie Lee Voelker and his crew roughly two years of tracking down enough cars through newspaper ads, junkyard searches and the California Dept. of Motor Vehicles. The most they paid for any single car was $1200, but in most cases they paid $300 or less. In pre-production around twenty-four Plymouth Furys, Belvederes and Savoys were acquired. They then combined all the parts from those to make seventeen functioning Christine's. Each car had a specific purpose. Some were "showcase" cars for when it would just sit there and look pretty or when Arnie was driving it. There was a "hot rod" version with airplane landing lights and a brand new 350 engine for the rampage scenes. There were "junked" and "shelled" cars for when the car was in disrepair. 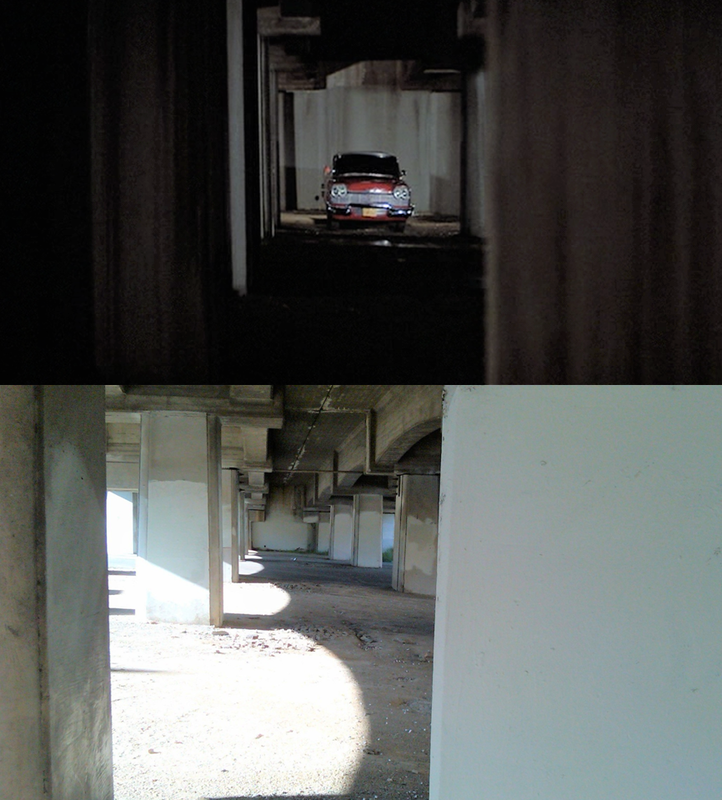 There were even "half" cars that were required for certain driving scenes. 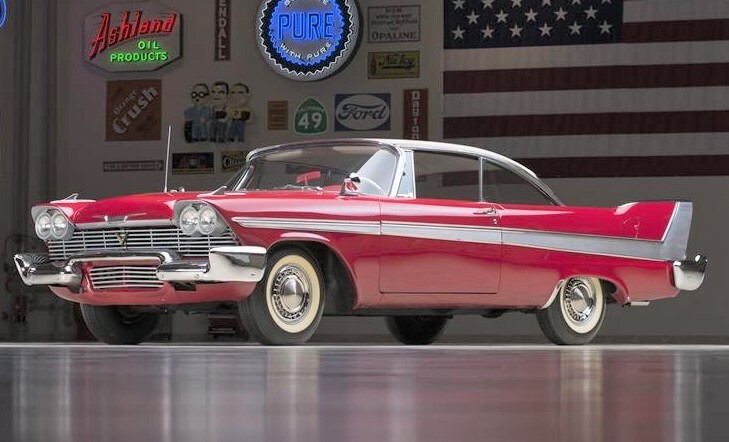 When filming wrapped, only two of the Christine's were left undamaged. Shortly after filming concluded, Ed Vickroy purchased most of the cars and parts for $1500 and had them shipped to Bill and Ed's (not Ted's) Auto Dismantling in Fontana, Ca. 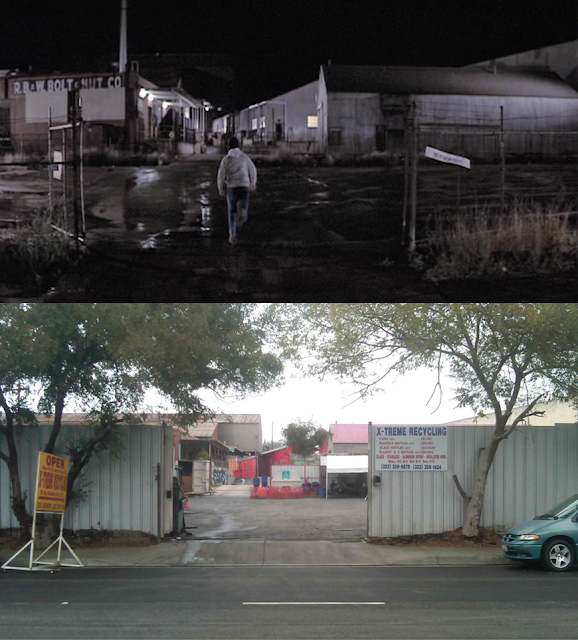 Within two years, all of the cars and parts associated with the film were gone from the wrecking yard, retrieved by automobile restorers and movie fans alike. From the information I've been able to accumulate, there are three remaining Christine's in existence today. One is one of the stunt car Christine's, owned by Martin Sanchez. Today it sits in the Petersen Automotive Museum located at 6060 Wilshire Blvd. Los Angeles, Ca. 90036. The inside of the car's glove box has even been signed by John Carpenter as well as some of the film's cast members. Martin's story is very similar to that of Arnie Cunningham's. When he was fourteen and a half years old, he bought his first car, a 1969 Pontiac convertible. His parents were upset that he "drug" it home and he spent hours upon hours restoring it, only to have it ultimately ruined by some assholes from school that didn't like him. His auto shop teacher suggested he read the novel Christine. He thought it'd be cool to have a two-door Plymouth. So, in 1984 he purchased the car through Al Newman, who owned Classic Wheels in Anaheim, Ca. for $900. He recalls, "She was pretty much gutted out inside with just a plastic racing style bucket seat with a five point harness and a roll cage." Also, the radiator was mounted in the trunk along with a fuel cell. Martin and his father made about six trips to Bill and Ed's Christine graveyard to gather parts for the restoration. Among parts gathered was pretty much the entire interior of the car that Buddy and company trashed as well as most of the outer stainless from the burn car in the film. For that scene, they poured rubber cement all over the car and set it on fire. The burn glue simply peeled off and the trim was unharmed. It took about three years of hard work to get his Christine presentable to his dad's satisfaction. Martin and his dad really bonded through it's restoration process. 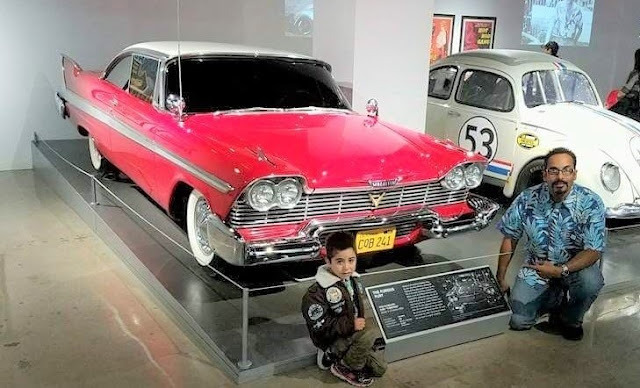 Today whenever he visits his dad's resting place, he reminds him, while holding back his tears, "Christine is at the very museum that you and I would go to. Thanks dad." As his dad always would laugh and mumble to him, "No one wants that old Mopar there." That museum is the Petersen Automotive Museum. Another is the "Christine Promo Car", used for most of the closeup shots. In 1983 Columbia Pictures arranged a nationwide giveaway drawing in order to promote the film. It was sponsored by USA Network, "Night Flight" producer ATI Video, Kenwood and Motown Records. The grand prize winner was announced on "Night Flight's" New Year's Eve program. Out of 40,000 postcard entries, Scott Edminster was proclaimed the winner. In 2004, the car was purchased by collector Ron Pratte at the Barrett-Jackson Auction in Palm Beach, Fl. for $170,500. Eleven years later, in 2015, it was purchased by Bob Bartosiewicz, founder of CGI Communications, at the Barrett-Jackson Auction in Scottsdale, Az. for the winning bid of $180k, $198k after commission. Today it sits in the Rochester Auto Museum located at 140 E. Main St. Rochester, NY. 14604. At some point, the producer of the film, Richard Kobritz also owned the car. One is owned by Bill Gibson. He was always a huge fan of the book and film. His particular car was built from many of the discarded Christine's and parts from the film that were transported to Bill and Ed's after filming concluded. 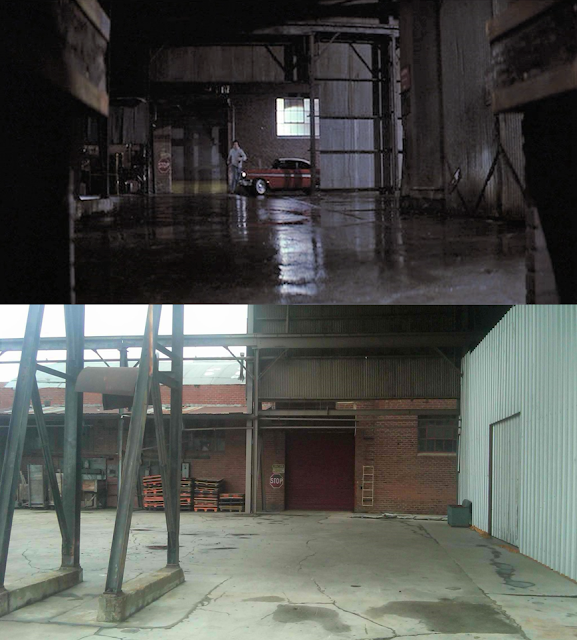 Ed Sandlin Sr. worked for John Carpenter, and his son Ed Sandlin Jr., who was around twenty at the time (1983) had wanted one of the cars, but they were unable to acquire one from the studio after filming had wrapped. So, they did the next best thing and found one else where that was in desperate need of restoration that the studio hadn't acquired while doing their Christine search during pre-production. Sandlin Jr. then visited Bill and Ed's where he had as many parts as he wanted to chose from in order to Frankenstein the car back together. Fast forward twenty-two years later and in 2005 Bill purchased the car from it's current owner in Oklahoma. He then set out to have the vehicle, which was in need of some work, fully restored to it's full potential. He found Earl Shiflett of Classic Car Creations in Cocoa, Fl. 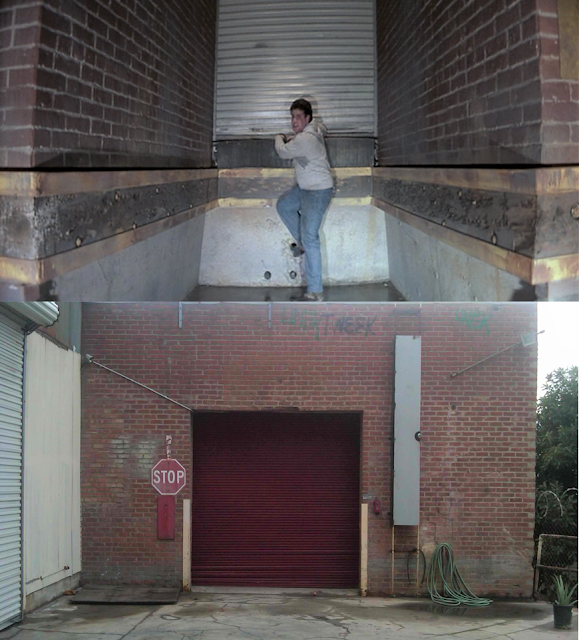 and in 2010, the restoration process began. They set out to make everything as close in detail to the 58' Fury seen on screen as possible. Everything got the deluxe treatment and no expense was spared. For a more detailed description of the restoration work done, feel free to read the Restoring Christine article by Justin Beahm in HorrorHound issue #40. Bill didn't stop at simply restoring his Christine, he also had an electrical effects package added, that would elaborate more on what the car did on screen. In 2012, when he received the finished product, he was in shock at how incredible she looked. "I sat in her and felt like I was in the movie, caressing the steering wheel, wanting to stay in there", Gibson recalls. Today, Bill's Christine can be found on the convention circuit and other special appearances. I got the chance to see his car close up and in person at the HorrorHound Cincinnati convention in 2013 and it definitely did not disappoint. 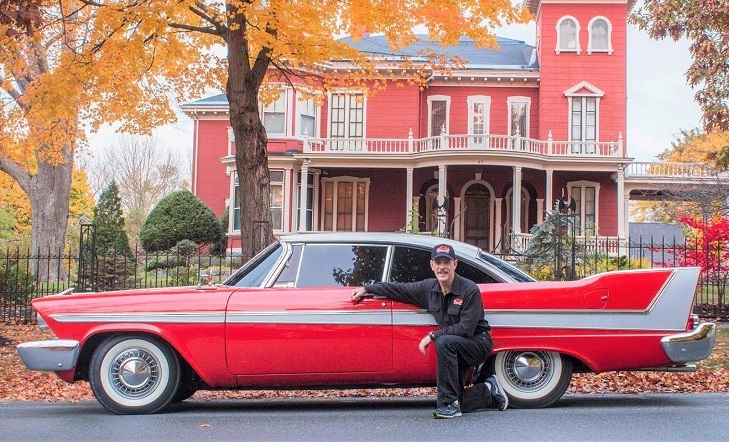 Aside from the car, Bill has also accumulated an absolutely ridiculous collection of Christine related memorabilia and souvenirs that he also shows to fans along with his car at conventions. For more info on the car feel free to visit his website. The house was built around 1948. 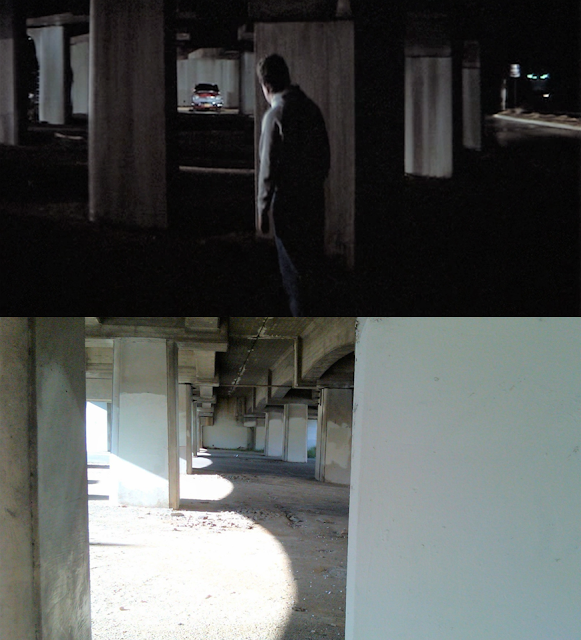 Only the exterior shots were filmed here. 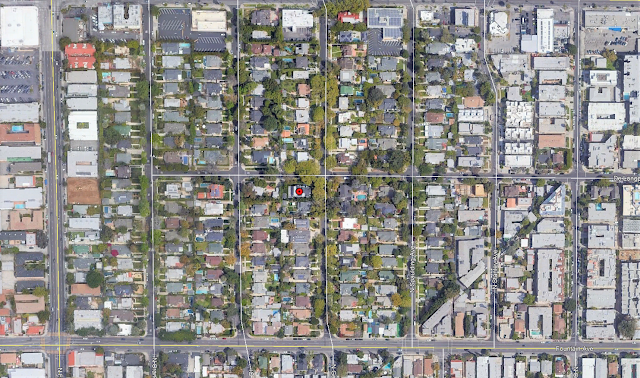 Interior's were shot two houses down at 1109 Buena Vista St. Also, about a block north of the house is where the "Hey jerk, speed kills!" 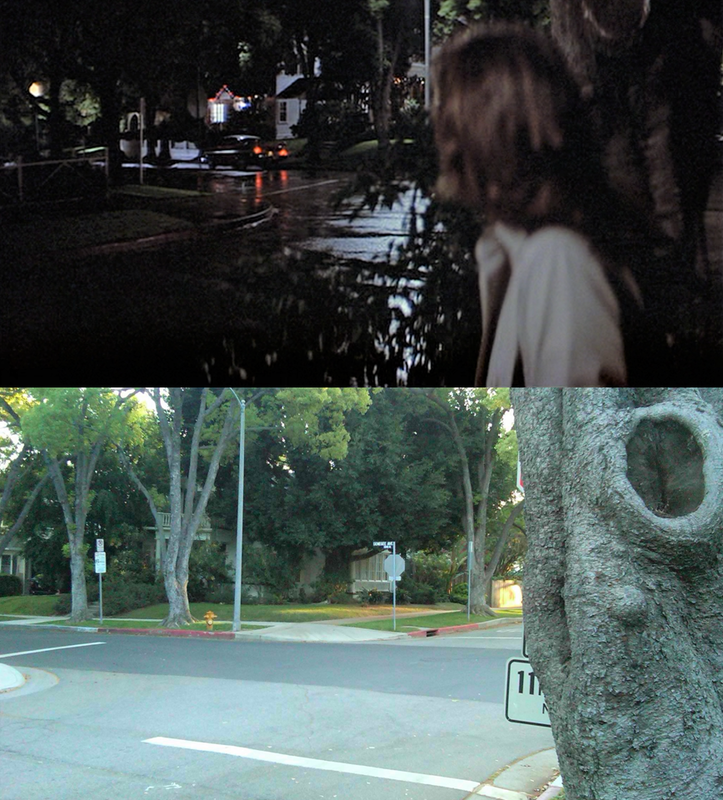 scene from Halloween was shot. 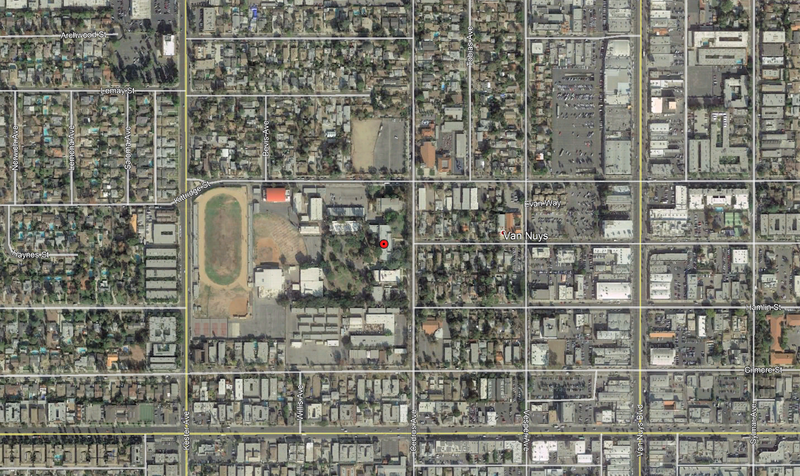 And about a block west of that, on the same street, is where the Strode house from the 2007 remake sits. 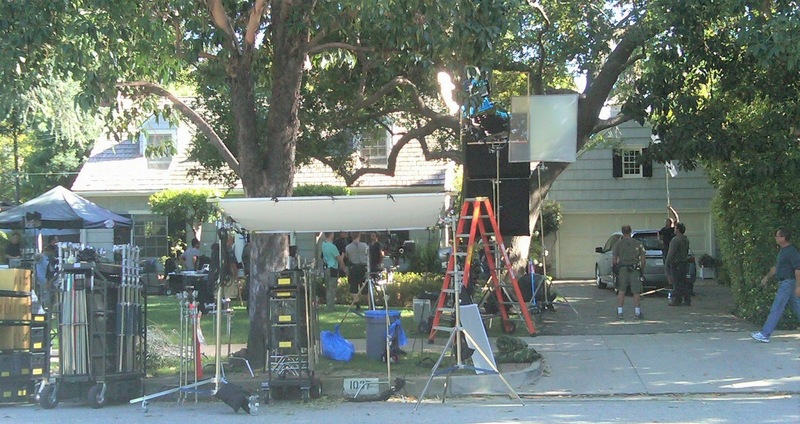 The first time I visited the house in 2009, they were shooting a Honda commercial. The house where the interior's were shot. 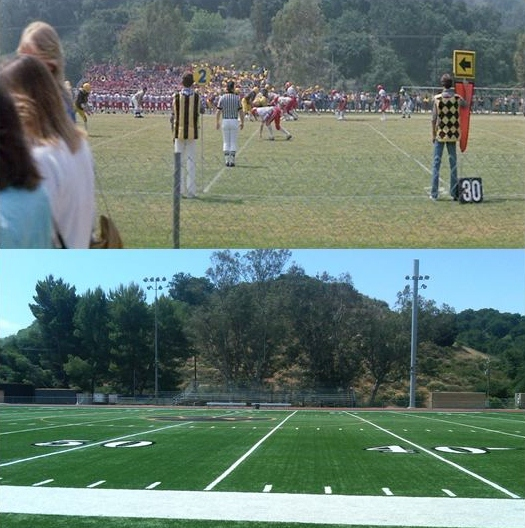 John Carpenter used four different high school's to depict Rockbridge High. 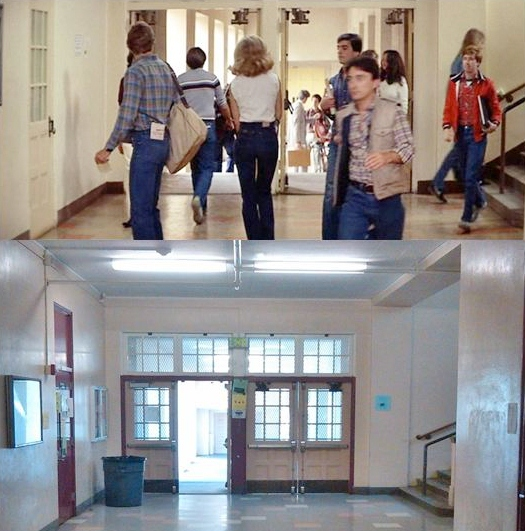 This one was used for the hallway with the lockers, the scene where Dennis asks Charley if he's seen Arnie (at lunch), and the scene where Detective Junkins is waiting for Arnie in the school parking lot. The school opened in 1914. The main building and auditorium were built in 1933. Notable alumni include Paula Abdul, Erika Eleniak, Joseph Gordon-Levitt, Stacy Keach, Marilyn Monroe, Robert Redford and Natalie Wood. Other notable productions here over the years include Fast Times at Ridgemont High, My Stepmother is an Alien, Sleepwalkers, the pilot episode of The Wonder Years and the music video for Vitamin C's 2000 song, Graduation. All "Now" pictures taken in 2009. The school opened on October 4th, 1914 as Owensmouth High School, with fourteen students and three teachers. 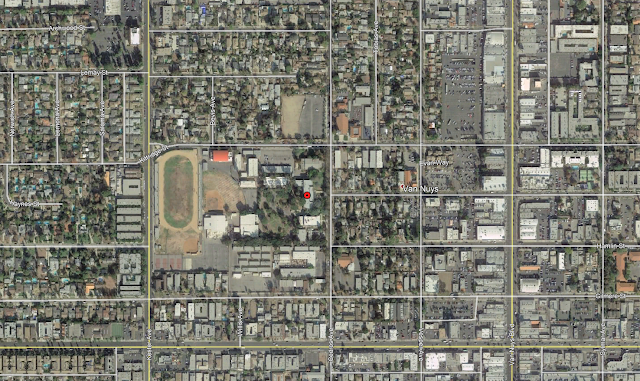 The school's name was changed in 1931, after the community of Owensmouth changed it's name to Canoga Park. Notable alumni include Bryan Cranston, former UFC fighter Keith Jardine and Jackie Earle Haley. 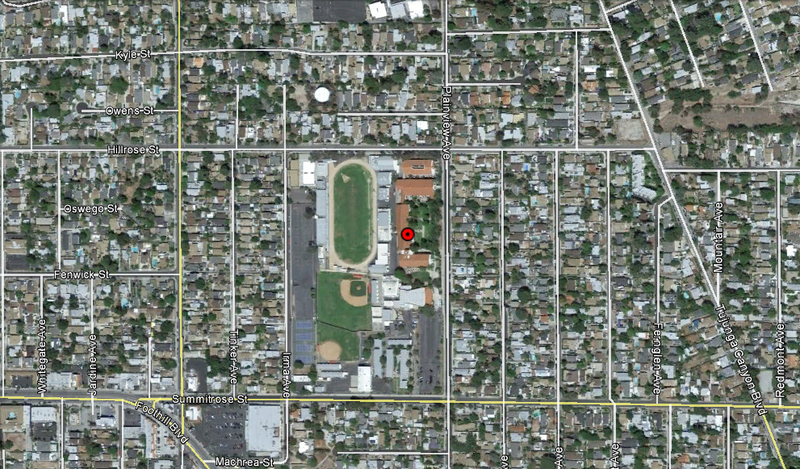 Aside from the aforementioned Van Nuys High School, some scenes from Fast Times at Ridgemont High were filmed here as well. I was really excited to visit this location, based on the fact that the scene scared me so much as a kid. The house was razed sometime after filming and the Osborne Place apartments now sit where it once stood. The school opened on September 13th, 1937. Notable alumni include A. Michael Baldwin of the Phantasm film series and The Smothers Brothers. Other notable productions here over the years include Better Off Dead, The Craft and Not Another Teen Movie. 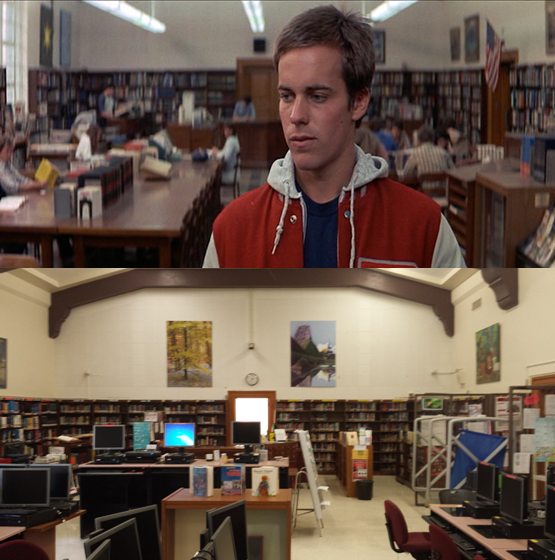 When I visited the library I was astonished to see that some of the paintings visible on the walls in the film were still hanging in exactly the same place, over thirty years later. 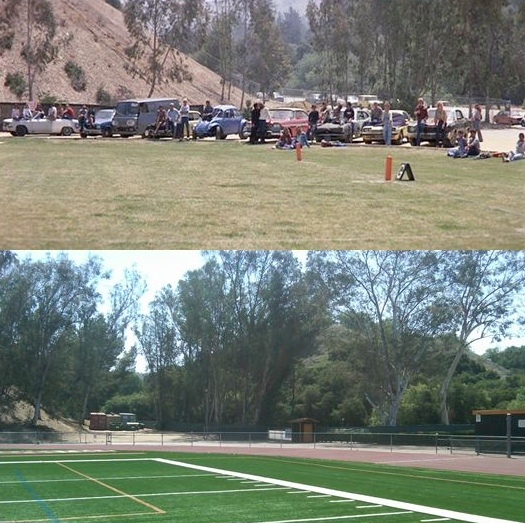 The school opened in 1975. Notable alumni include Katie Cassidy, Danielle Fishel, Erik Menendez of the Menendez Brothers, sports radio host Jim Rome and Ricky Schroder. All "Now" pictures taken in 2015. The house was built at some point before 1952. 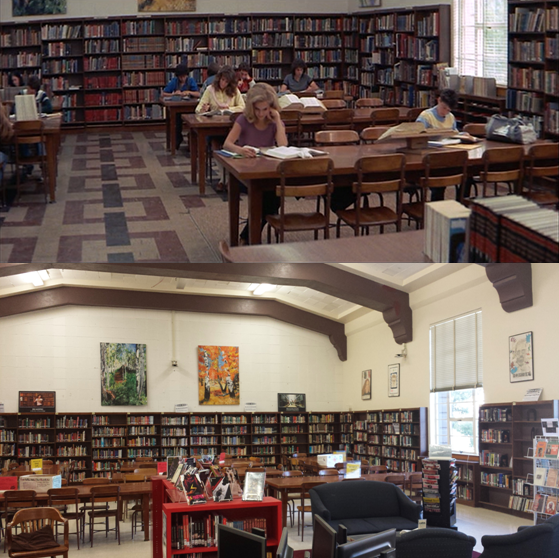 All "Now" pictures taken in 2013. The overpass had been there since at least the 1940's, but sadly for fans of the film, it was demolished in 2016. I visited the location in 2011 while the overpass was still there and it was one of my favorite locations that I visited from the film due to it being such an important scene, displaying Christine's rage, and how you could tell exactly how everything unfolded shot for shot, by being there. While Moochie is running it cuts to another location that is in actuality two miles from the previous overpass scene. From the point where he runs out of the alley and onto the street where Christine's headlights appear in the distance to where he is smashed in the loading dock, everything is shot like it really appears geographically. 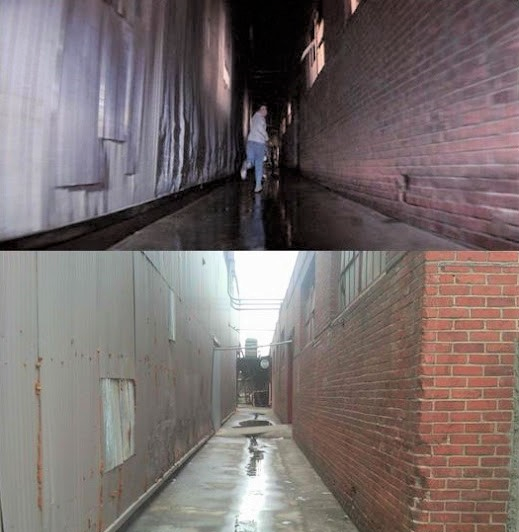 This area still looks very much the same and not much has changed over the years. The structure was built around 1970. For any fans who visit this location, it might not be a bad idea to purchase a lottery ticket while there, as Valencia Liquor has had winners of $65,000 and $34 million in years past. This is the spot Buddy screeches his Camaro to a stop and attempts to back up, while Christine is in pursuit. In actuality it's just a small street that runs into the hillside. Mobico is a fictitious gas station, probably derived by combining Mobil and Sunoco, two well known actual gas stations. During the time of filming, the entire area was quiet and desolate. 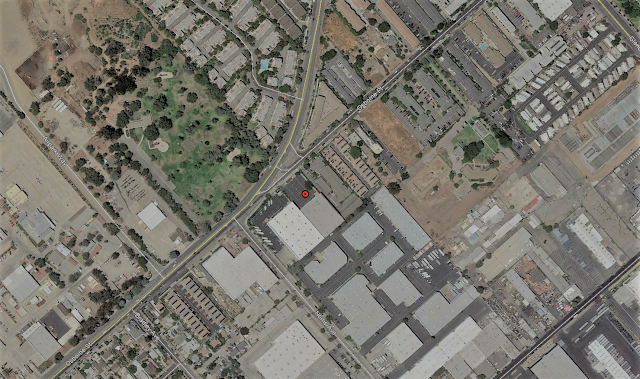 Now, it's a heavily populated area with several structures and business's. 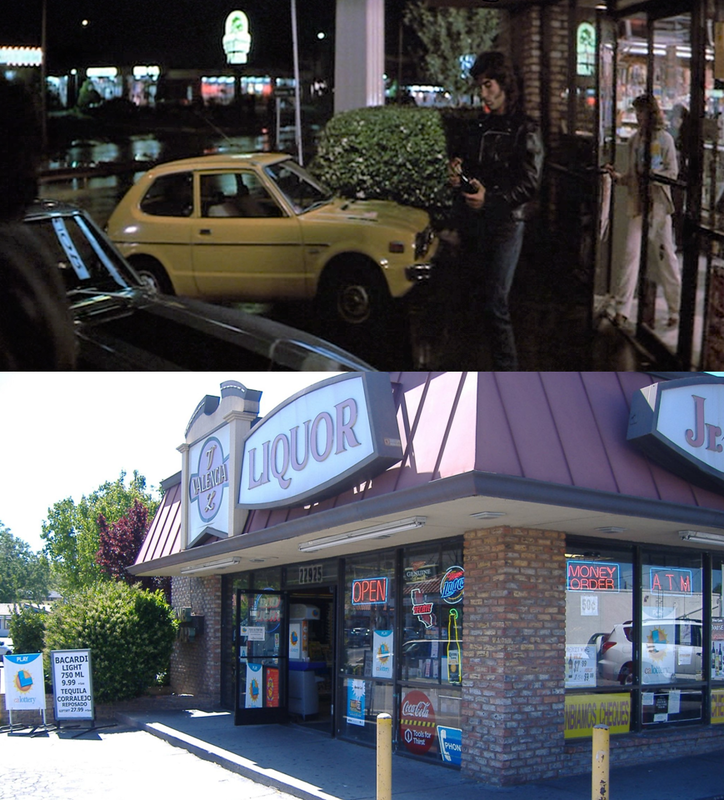 The entire gas station was a set constructed for the film. The explosion happened around two in the morning and could be seen from miles away. Now sitting where the gas station set would've been, is a Corner Bakery Cafe and just across the street sits the Westfield Valencia Town Center mall. The house was built at some point before 1948. It's on the same street as Nancy and Glen's houses from A Nightmare on Elm Street. 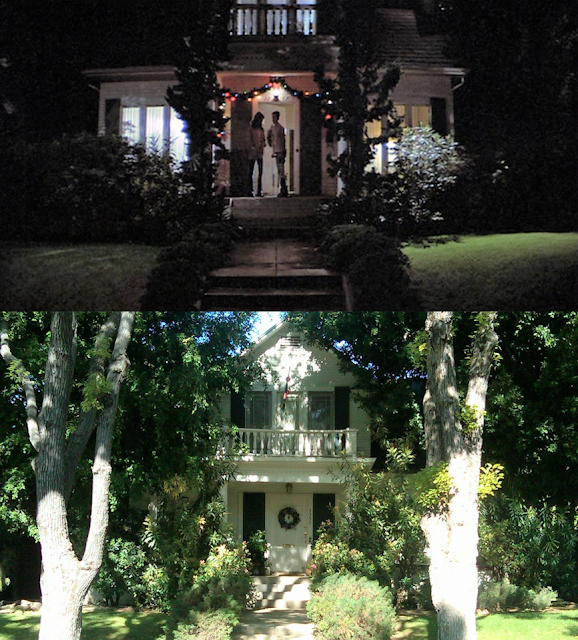 The house is also shown twice in the original Halloween. The first time is when Lori is sitting on the corner pedestal while holding the pumpkin and she looks left. The second time is later in the film when Dr. Loomis spots the station wagon. 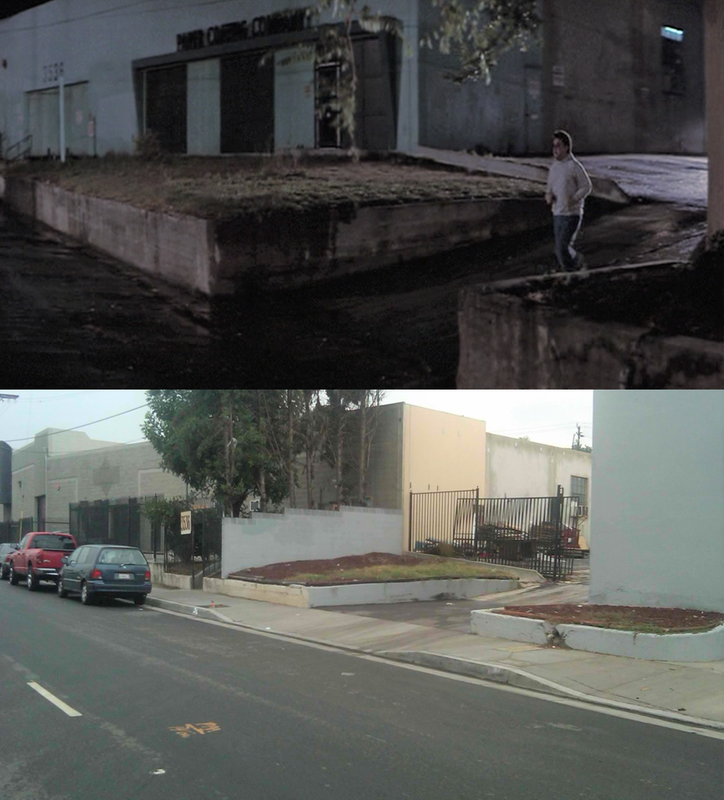 The large tree Leigh hides behind while Arnie picks Dennis up was cut down in 2012. WOW Great Thank you !!! You did a great job (Your pictures are very "accurate") I hope accurate is the right word to say "exact"
Thanks Carlos, glad you like them! 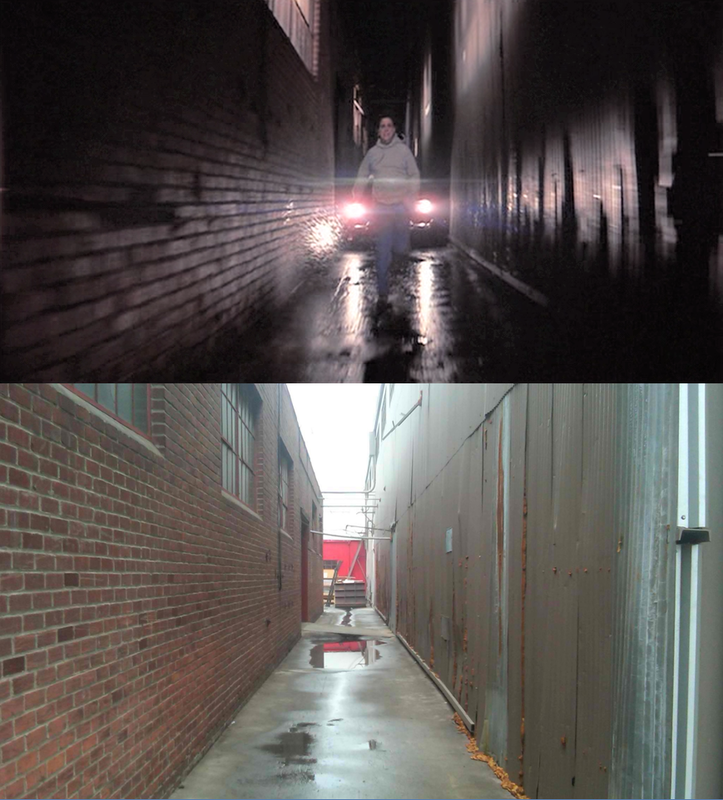 In most cases I try my best to take pictures from the same angles shown in the film. Great job! 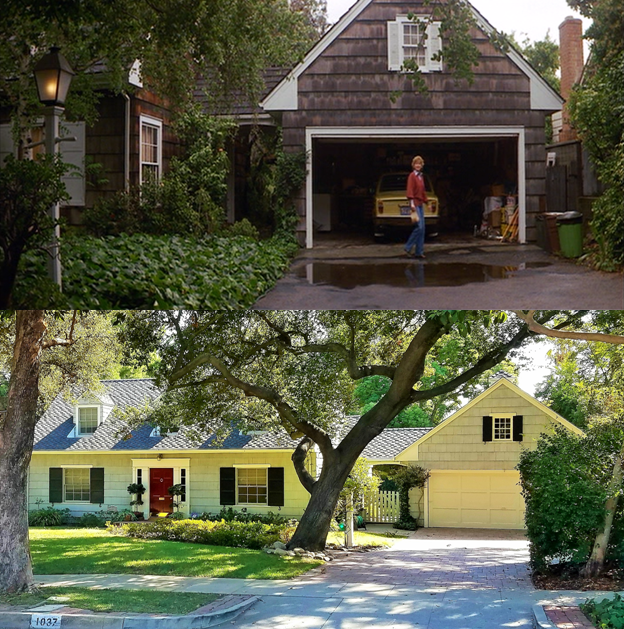 Do you have any idea on what street LeBay's house was? 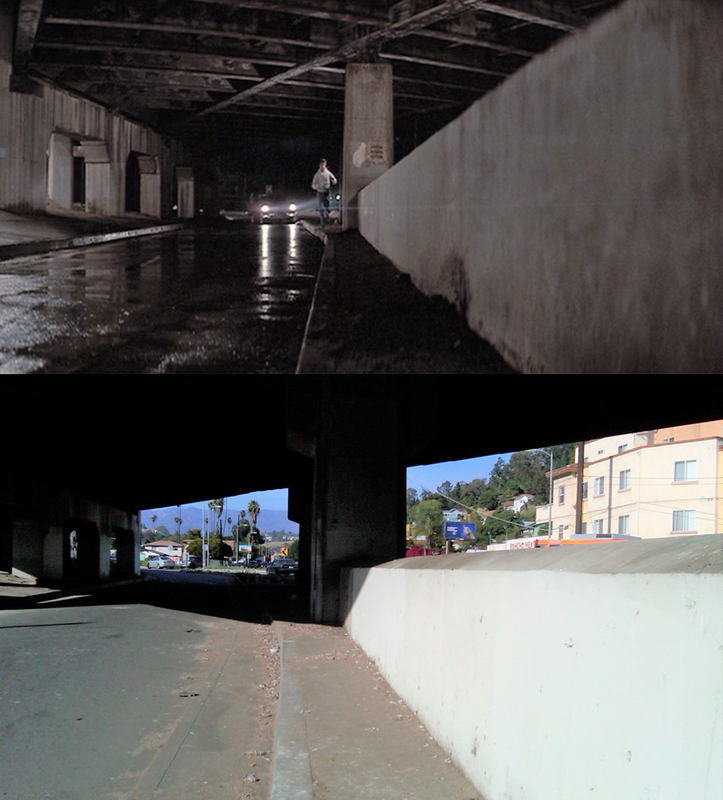 The underpass where Christine confronts Moochie no longer exists. Damn, that's a shame. 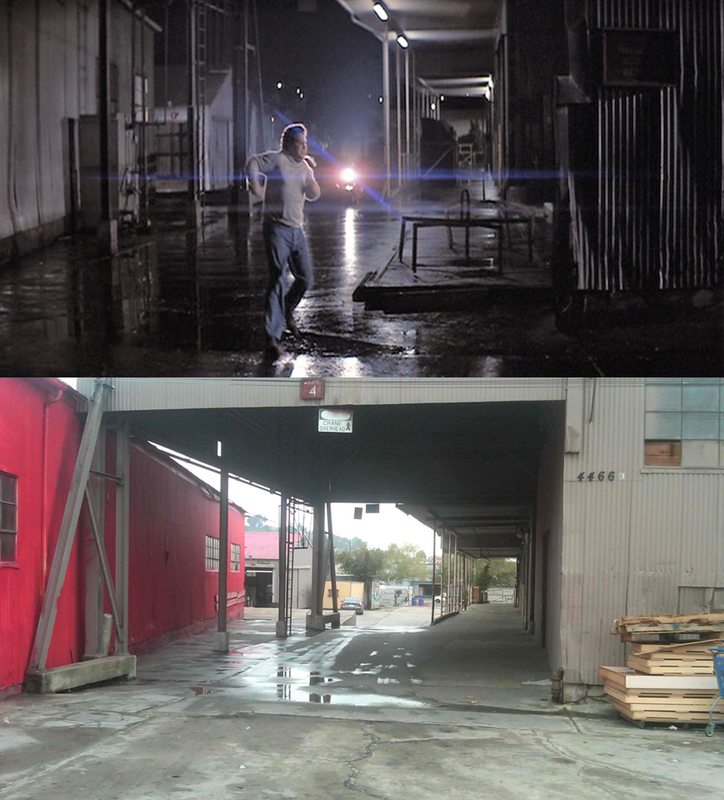 I always felt like that was a pretty important location from the film too. 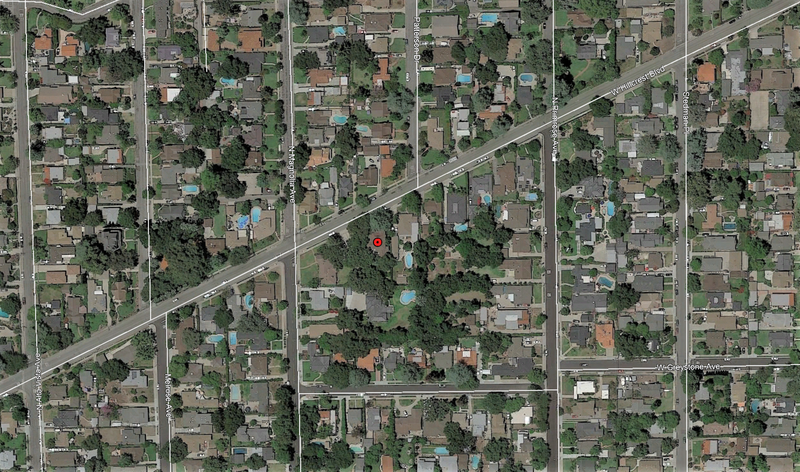 LeBay's house WAS located at 12370 Osborne Place Los Angeles, Ca. 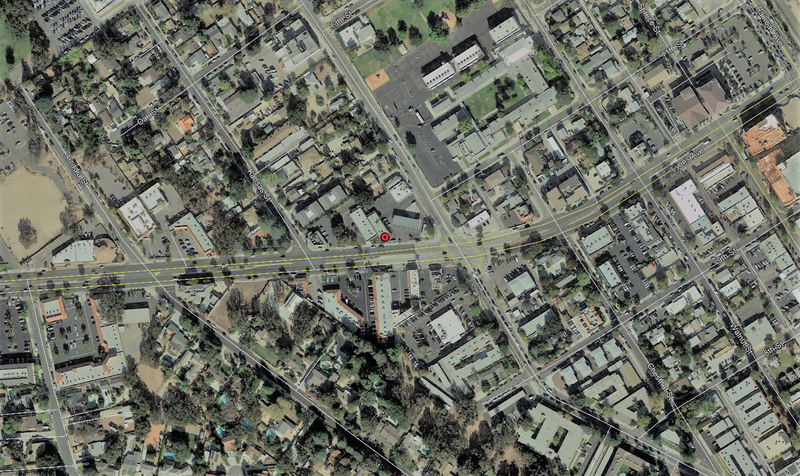 91331 but it was demolished some time ago and condominiums now stand in it's place. Awesome! Thanks! One of my favourite movies. Great job!! I'm watching it now! Darnell's was located at 15703 Arrow Hwy. 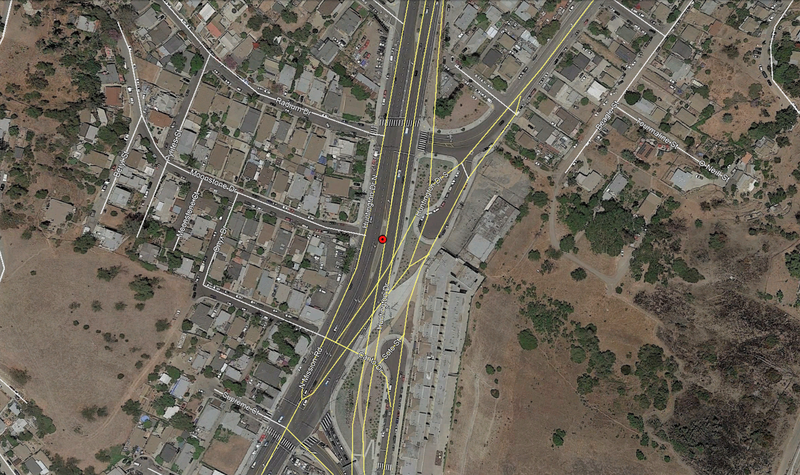 Irwindale, Ca. At some point in was torn down and an industrial park now stands in it's place. 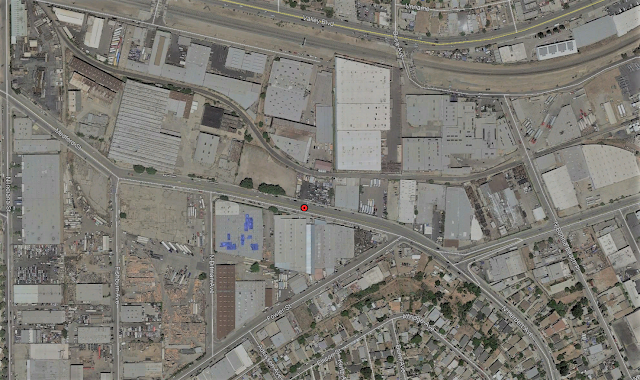 I seem to remember a location that was Darnells at Norris ave in Pacoima... I worked in the building next door, and they had film crews, and bunches of Furys around... Does that sound right? 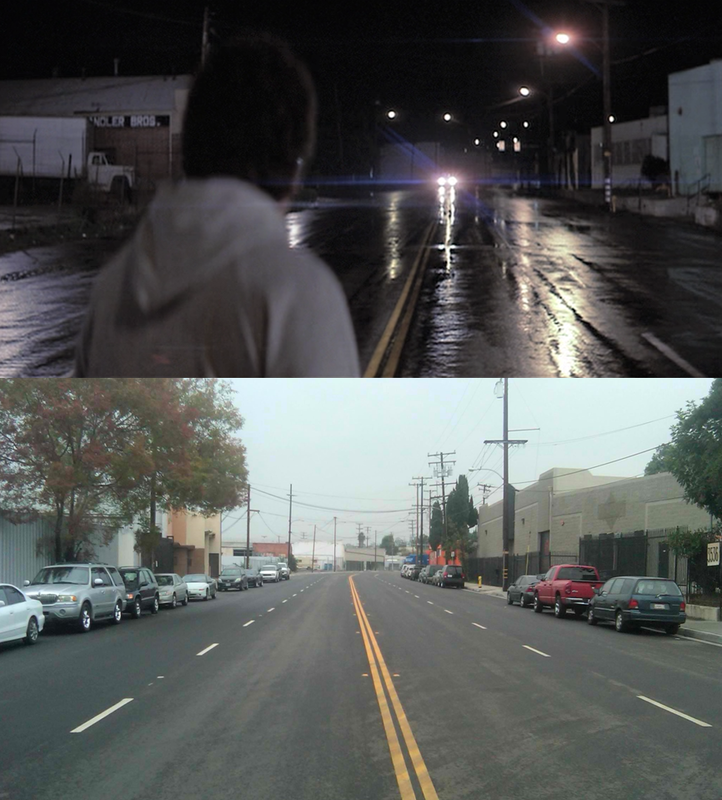 Perhaps the place on Norris Ave. you're referring to was used as a different location in the movie? 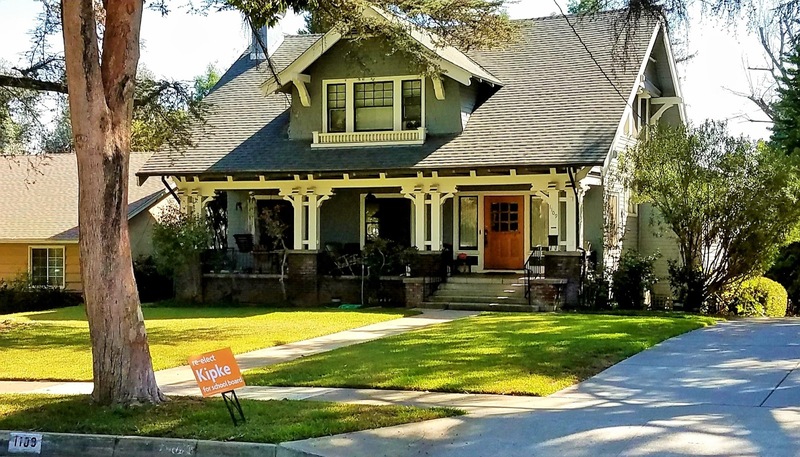 Be careful at Arnie Cunningham's house, I guess a police officer patrols the neighborhood and someone jogging saw me take a few pictures of the house and alerted them. I had to thoroughly explain why I was there so If you do it just leave really quickly. Really nice work here...love this movie. 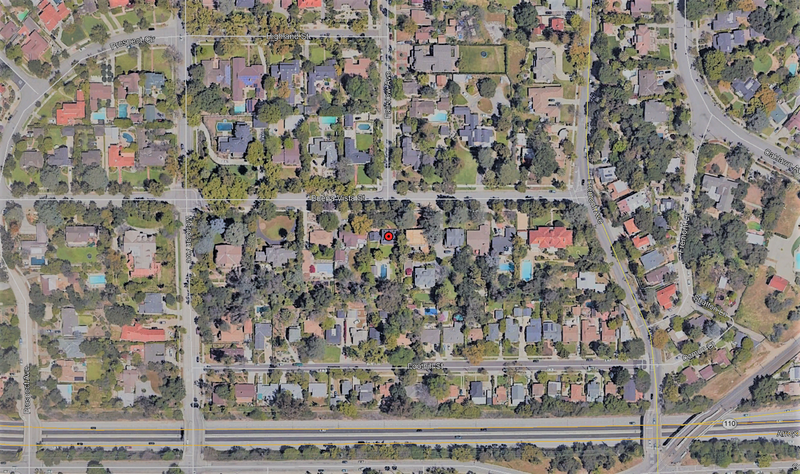 Never knew Dennis Guilder and Nancy Thompson were practically neighbors! 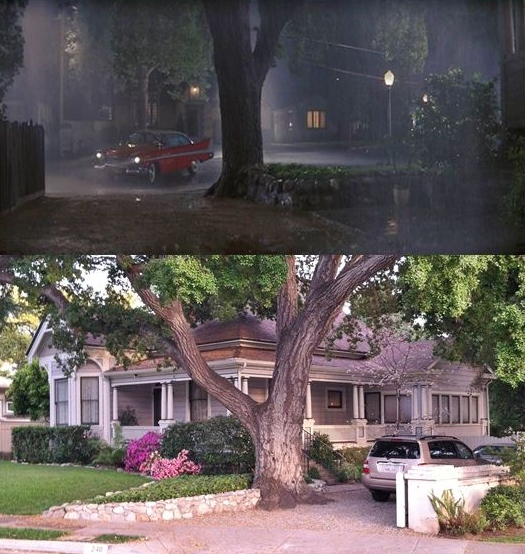 What's also really cool is that the house that served as the Guilder home is also visible a couple of times in Halloween....it is in the background when Doc Loomis runs up to the station wagon. 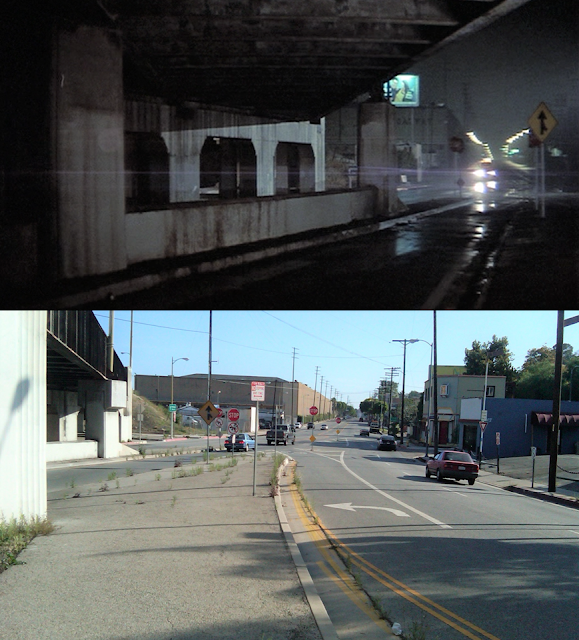 Some years back I e-mailed John Carpenter's website to ask if I was correct about this, and I got a reply saying no, the films were shot in different neighborhoods. I think NOT, lol. great pictures!!! thanks so much! its playing now on encore....... are there any other movies that have pictures like these? 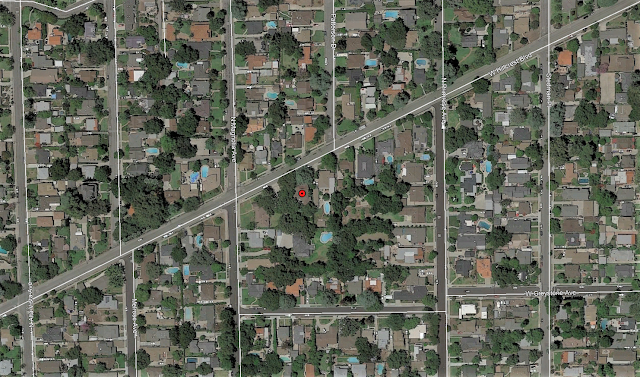 I think I have found Lebays house on Google maps looking at the 2007 images?? Unfortunately Lebays house was gone by the end of the 80's. What an awesome write up. Brings me back to memory lane. Before cell phones and affordable cameras I use to go to all those places. Great to see this. Wow, Bill. This is a treasure trove. Thanks!